Dedicated to the late 19th-century emperor who opened Japan to the West, Tokyo's most famous Shinto shrine is wonderfully serene and austere, not colorful or flashy like other Asian places of worship, and is less of a tourist trap than Senso-ji, the big Buddhist temple across town in Asakusa. The 40-foot-high (12-meter) torii gate at the entrance to the 200-acre park is made of 1,500-year-old cypress, and there's a second one like it closer to the shrine itself. Stop at the cleansing station where you can dip into a communal water tank and purify your hands and mouth before offering up a prayer. You can write wishes on little pieces of paper and tie them onto the prayer wall, or do as the locals do  toss some yen into the offering box (it's near the enormous taiko drum), bow your head twice, clap twice, and bow once more. 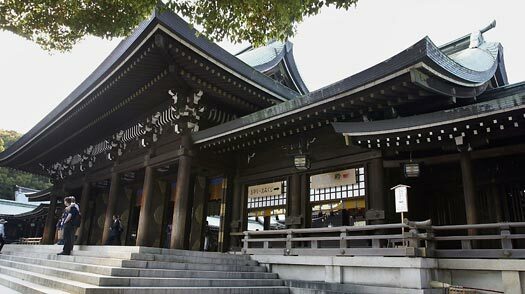 On Sunday mornings you are likely to see a traditional wedding procession (or two) through the courtyard  the bride in a white kimono and hood and the groom in his formal black robe, walking together under a big red parasol, with Shinto priests leading the way and the rest of the wedding party trailing behind. Shrines, big or small, can get interesting on festival days. Check the calendar to see what's happening.